If you’re venturing into writing articles to produce content or to get started as a writer, here are some basics to get going. Q: What is an article? An article is a piece of writing that gives information (rather than opinion.) Its purpose is to explain or inform. Q. Why should I write articles? Information is currency. People find information they need: how to do things, where to buy things, and how to solve problems. Why shouldn’t you be the person to answer their questions? When you write an article, you become a source of information. If you write helpful, credible, well-constructed articles, you become a trusted source of information. When you write several articles, particularly about a particular topic, you become a go-to source for information about that topic. Q. Where are articles printed? In newspapers, magazines (online and in print), websites, newsletters, business or trade publications, technical journals, and in scientific, academic, or scholarly publications. Q. 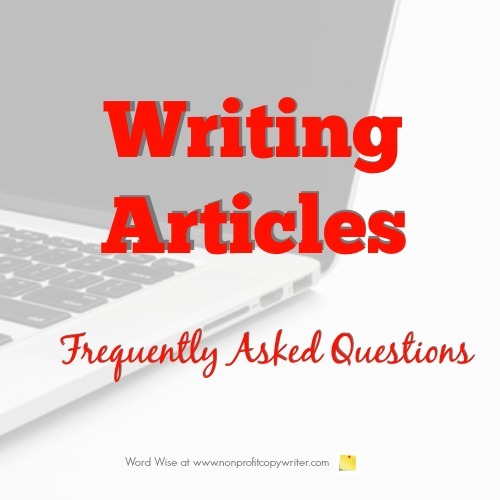 How are articles different from blog posts, editorials, essays, or copywriting? Q. What kinds of articles are most common? Interviews, how-to pieces, news, investigative reports, travel pieces, technical articles, profiles, academic reports, case studies, and new product introductions. Here is a list of 29 types of articles you can write. Q. How long is an article? That depends on where it’s published and who reads it. Publishers specify article word count in their writer’s guidelines. Articles 500 words or less are considered “shorts.” Average feature article length is 1000-3000 words. Academic and scholarly articles, of course, are longer. Longer articles typically include more research and explanation. Q. I’ve heard that article writing focuses on research. How much? Don’t confuse “research” with “information.” A good article is grounded in facts, which can include statistics, quotes, definitions, examples, anecdotes, references, tools, resources, or products. You accumulate “information” when you “research.” Keep good records of your research and you’ll find that you have plenty of information to write an article – or more than one. Q. Can a writer earn a living writing articles? Sure. As in any other business, article writing can become a specialized skill. Many freelance writers earn a decent living writing for publications, especially when they accumulate a lot of information about a particular topic and write about it often.